Enhanced Oil Recovery (EOR) is referred to methods which are used to increase the production of oil from oil reservoirs. One of the most-commonly used methods is Gas Injection. The first benefit, obtained with gas injection, is increase in reservoir pressure which results in higher driving force which produces more oil. Furthermore, some times injected gas mixes and is solved in oil (miscible gas injection). In this situation, viscosity of oil decreases and therefore oil can move easier than before which results in more oil production. The most-commonly gases used for gas injection are : CO2, natural gas and N2. Based on the phase behavior of CO2, in high pressures of oil reservoirs, usually it becomes miscible with crude oil (This miscibility is a function of temperature and oil composition as well). Conventional EOR methods can increase the production of oil, however they can not produce trapped oil inside the reservoirs. Trapped oil is referred to the oil which is trapped inside the reservoir due to capillary forces in pore space. Injection of CO2 , can help us to produce that part as well taking advantages of miscibility feature of CO2. Miscibility of CO2 in crude oil as it was explained above. 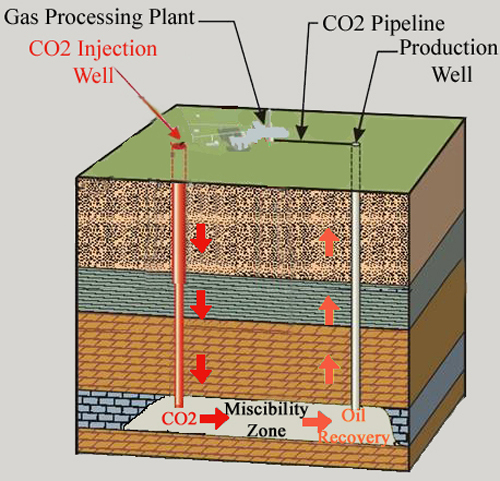 Hence basically CO2 injection improves oil recovery and at the same time, green house gas profile is improved as well. There are some constraints for CO2 EOR. Technology, economics and CO2 supply are the main constraints. Long pipelines are required to transfer CO2 from the source to the oil field. High pressure compressors are required as well for injecting the supplied CO2 into the reservoirs. and one should consider the amount of incremental oil to see if it will pay off the costs. Recently new methods have been applied which economize and increase the efficiency of CO2 injection. Water Alternating CO2 & Simultaneous Water and CO2 injection are the recent CO2 EOR which have been proposed to increase the recovery. Injecting water, we will need less CO2 supply and also we can sweep those parts of reservoir which have not been by CO2. CO2 EOR has been growing in the United States. 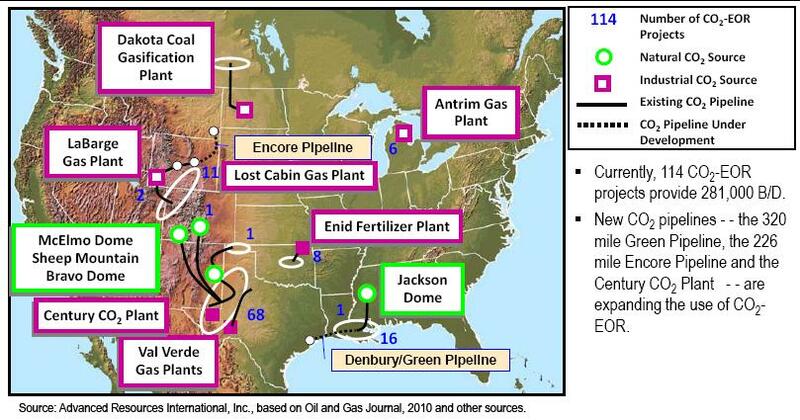 There are considerable amount of residual oil in the US which is an excellent target for CO2 EOR. Increasing domestic oil production and decreasing domestic CO2 emissions are two of the nation’s highest priority goals . Consequently, Department of Energy (DOE) has been investing on CO2 EOR researches to move towards these goals as much as possible. Here in University of Texas at Austin, there are many CO2 EOR projects funded by DOE in the department of Petroleum and Geosystems Engineering. There are 114 CO2 projects installed in the US which provides 281,000 incremental barrels of oil per day in the US which is equal to 6% of the US oil production. It is estimated that 26 billion to 61 billion barrels of economically recoverable oil could be produced in the US using currently available CO2-EOR technologies and practices. From environmental point of view, a recent publication by the Congressional Research Service showed that theoretically, carbon-capture technology could remove as much as 80-90% of CO2 emitted from electric power plants and other industrial sources . These estimations motivates government to encourage companies for doing CO2 EOR. The National Enhanced Oil Recovery Initiative (NEORI) plans to boost CO2 EOR by proposing a federal tax incentive for capturing and transporting CO2. While other EOR methods like chemical flooding has been shown to be more effective than CO2 injection and also considering the high cost related to transportation of CO2 to the oil fields, government should push companies toward CO2 EOR rather than other methods with appropriate policies.